Hi, I'm Melgie the owner/writer of "The Sweet Cuisinera" and "Wish4less" - welcomes you with Big S.M.I.L.E!!! 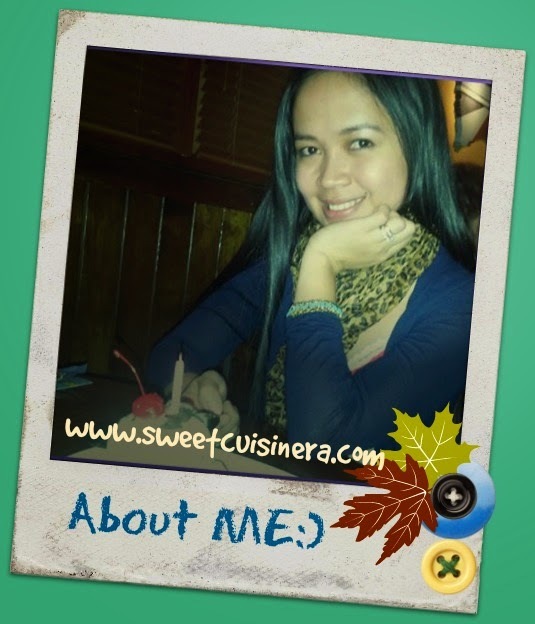 Blog Description: "The Sweet Cuisinera" is all about my homemade recipe collections, sweet treat ideas, food escapades and product reviews. Describe Yourself: I'm not a professional chef by any means, just regular wife and mom of my two little kids who happened to be in-love with baking and cooking food. I love trying new recipes, explore ethics flavors and experience great food adventure. Hobbies/ Interest: My hobbies includes cooking, baking, gardening and reading. My interest express mostly on my love on food, explore and experience other cultures through food. Favorite Food: I'm very adventurous when it comes to food, with that being said, I have a tons of favorites (hehehe). This blog will help you discover my favorites and learn simple recipes along the way. Delectable Goal: Sweet Cuisinera will help you create a simple, delicious and fast homemade meals for your family and friends. I also have few product reviews that will encourage and keep you inform on what's new in the market. I hope that my food and recipes will inspire you to make a scrumptious meals for your family and friends. For inquiries, questions and suggestions or even a recipe request.